During college football season, there are thousands of people that set up tailgates early on Saturday mornings and stay until hours after the football game is over. This is a great time to enjoy with family and friends (and maybe even some random strangers). I don’t think that anything beats Saturdays during college football season, especially for me – a huge UNL Huskers fan. Just like anything else you do, you always have to start with the basics. Follow these simple college football tailgating tips to make the most of your next experience. The worst thing that could possibly go wrong is for your tailgate party to run out of alcohol. More than likely there will be more people that show up at your tailgate than you anticipate, so you need to make sure you bring enough with you at the beginning of the day. Make sure to offer somebody that is standing there empty handed if they would like a beer. The tailgate spot that I go to usually has some kegs there, but I always bring some along with me so I don’t feel like I’m mooching every time. 2. Have plenty of food! The food should be ready about 1 ½ to 2 hours before the game starts. This gives the people that are going to the game more than enough time to eat something before they head to the stadium. You can always set the chips and snacks out earlier, but the rest of the food doesn’t need to be ready until later on. My personal favorite, even though it’s messy, is smoked ribs. I feel like I could eat those all day long and never get tired of them. Nothing stands out like a sore thumb than somebody that isn’t wearing the team colors. You want to show your school spirit because tailgaters are the best fans. Something as simple as a team jersey or school t-shirt will work just fine. You should also put up team flags and banners around the tailgate spot. 4. Invite everybody you know! You don’t want to be the tailgate party that doesn’t have anybody there. It’s always a good time when us college kids show up because we somehow get the adults into a crazy drinking game. My brother and his buddies are a few years older than me and they always think they can beat us at beer pong (trust me it never happens). This is also a great time to invite anybody walking around from the rival team to your tailgate because all you want to do is show them a good time. Trust me, you are able to earn your school a great reputation by inviting them to have a few beers with you. This is probably my favorite part because it gives me a chance to talk to people about the upcoming game and if they are enjoying Lincoln so far. Honestly any spot that you tailgate at before the game is going to be fun, but if you are a college student then the reservation (located north of the bottoms) is the place to be. There are hundreds of college kids there having a good time. We like to make our way to the Lincoln Journal star just before the game because it is close to the stadium and it’s a great tailgating spot. If you are at least 21 then almost any bar downtown will be a great time as well to get some food and of course have a few drinks. Tailgating can be a great experience for anybody on gameday. This is a great time to be social and just have a good time with friends and family. 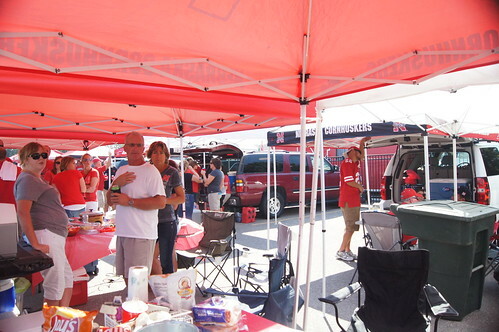 I hope you think of these 5 tips for the next time you go tailgating.